BUENOS AIRES (Reuters) - The U.S. Treasury's top economic diplomat said on Sunday that China's move away from market liberalisation was an increasing concern for G20 economies but reversed an earlier statement that the United States had ended formal economic dialogue talks with Beijing. David Malpass, Undersecretary for International Affairs, told reporters that there had been no decisions made about the future of the "Comprehensive Economic Dialogue" after meetings between U.S. and Chinese officials in July 2017 had "stalled." Malpass, a former Bear Stearns chief economist, said he misspoke when he told an Institute of International Finance meeting earlier on Sunday that the United States had discontinued the CED "because there wasn't a path back towards market orientation." He said Treasury Secretary Steven Mnuchin continues to engage senior Chinese officials in private, personal discussions "in order to try to bring the focus back to market liberalisation." The conflicting statements over the future of U.S.-China economic relations comes ahead of a tense Group of 20 finance ministers and central bank governors' meeting in Buenos Aires, where the frustrations over U.S. President Donald Trump's steel and aluminium tariffs and a potential U.S.-China trade war threaten to dominate discussions. The Trump administration is also said to be preparing punitive tariffs against up to $60 billion worth of Chinese information technology, telecoms and consumer products to try to force changes in Beijing's intellectual property and investment practices. However, Malpass did not specifically mention the Trump administration's "Section 301" investigation into China's intellectual property practices, including investment policies that effectively require technology transfers to Chinese joint venture partners. But at the IIF conference, he did criticise China's investment rules that restrict access for foreign firms, saying this "makes it very hard for the world to invest in China" in ways that are compatible with the investor country's laws. Malpass also told the conference that an increasing amount of state control over China's economy, coupled with the end of term limits for President Xi Jinping, was "worrisome to the world." He said “having such a big economy in the world move away from markets has not been good for us and the world and will continue to cause difficulty." "Our invitation is for the world to recognise this and also for China to recognise this commercially and move towards freedom and market orientation," he told the IIF conference that coincides with the G20 meeting on Monday and Tuesday. "This is completely an unworkable and non-reciprocal arrangement," he said. Regarding currencies, Malpass said that relative stability, partly brought about by broad global growth, had lessened the need for intensive discussions on the matter. 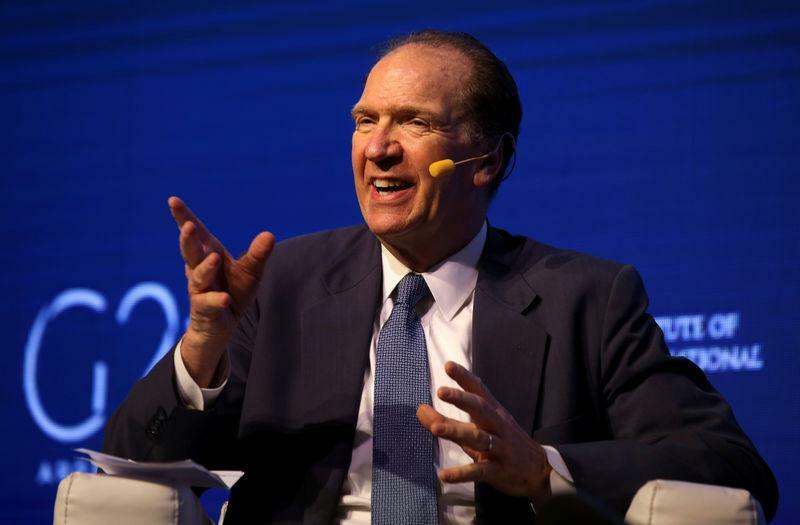 "One of the things we have is synchronized global growth and the currencies are relatively stable, so that is part of good policies in many countries around the world and that encourages growth and investment," Malpass said. "So I think we have a context where there's less criticality to the discussion of the exchange rates."